This disgusting truck spill ocurred on October 10, 2007, in Monticello, AR. The truck was hauling more thatn 500 pounds of decomposing animal entrails and hides, pig heads, and outdated processed meat. The driver slammed on his brakes on U.S. 425 and the disgusting contents of his trailer shifted forward and over the top. The road was closed for a half-hour and bystanders gagged while a 15-man crew cleaned up the smelly spill. 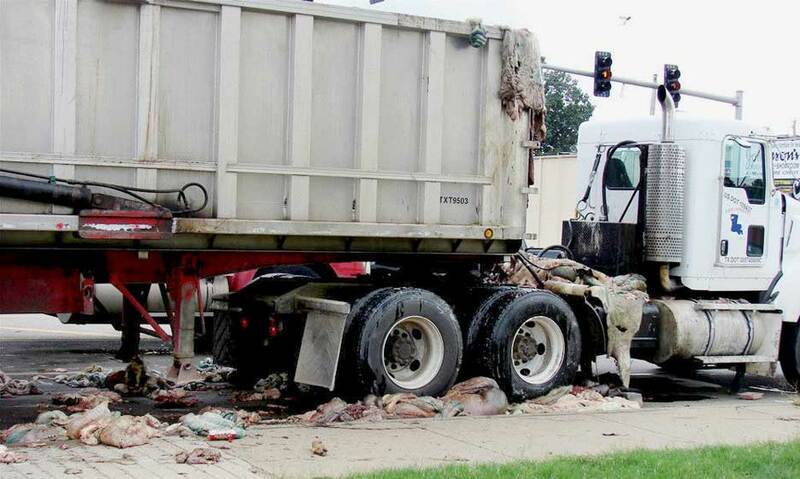 The driver was on his way to a Wal-Mart to pick up it’s outdated meat. He was cited for spilling the load and having no proof of insurance and the trucking company will be billed for the cost of the cleanup. There is no law or regulation requiring a load of rotting entrails to be covered. This is a good example of how little you know about what’s in the trucks that you pass everyday on the road. You see this type of truck all tht time and you’d never guess it was carrying entrails.